GO GREEN WITH OTHER ALTERNATIVES! Our main concern about Holland in 2050 is that we will no longer have coal to depend on. Canada and China have already made plans to import much of the coal we produce in the United States. As a nation, we need to discover more efficient, clean, and reliable energy sources. But, looking on a smaller level at our beloved Holland, we should start with investing. Being smart never doesn't have to mean being cheap. An investment is necessary to improve our future. If we invest in some alternative energy sources, such as the ones discussed, we are more likely to have a better future. Building a new coal plant might seem like an easy-out right now, but coal will start to become expensive. It all comes down to supply and demand: supply will decrease as demand increases and the prices will increase dramatically. Prediction: Coal will be gone after 40 years. Solution: Invest in alternate energy resources. Benefits: Jobs will be created, alternative energy is renewable. A magnetic generator is a device that utilizes the force of repelling magnets to generate electricity. They essentially are supposed to generate free energy for several generations with minimal repairs. 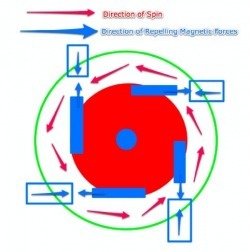 The spinning motion generates electricity through a system somewhat like a dam, where the water spins the turbines to generate power, but instead, magnets are used. Although this is a fairly undeveloped subject, many people claim that you can build one for under $100.00 and save 50% on your electric bill. - LED lights last 10x longer than incandescent bulbs. - LED lights are 4x more efficient. - LED lights use 80% less energy. - One 18-watt LED light will save you 570 kilowatts of energy, which transfers to nearly $50 on your energy bill. - Although the up-front cost of LED lights is more expensive, the long term cost will be less than an incandescent bulb. - Longer Lifetime: 50,000-100,000 hours... or 11 years! One LED light bulb keeps one half ton of carbon dioxide out of the atmosphere through its life cycle. If every house in the United States switched to LED lights, 90 power plants could shut down. This means less pollution! 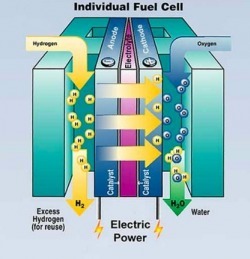 Hydrogen fuel cells would be best utilized in cars. When hydrogen reacts with oxygen, it creates electrical current which would be a great asset to electric cars. The only byproduct of this reaction is water vapor! It’s pollution free. The technology for this is still being evolved to become more efficient, but its possibilities are endless. There are no reserves of pure hydrogen on earth, so it has to be separated somehow. This process usually requires the burning of a fossil fuel, which still results in emissions. However, technology can be created to better this process and create a cleaner, safer, and more efficient production of energy. Thermal Energy is created from the heat deep inside the Earth’s core. This heat is conducted through layers of rock that eventually become magma. Magma is less dense than the rock surrounding it, and therefore rises toward the Earth’s crust. This heats rock and water that is near the Earth’s surface, sometimes to almost 700 degrees Fahrenheit. Most of this water stays deep underground, trapped in cracks and porous rock. This natural collection of hot water is called a geothermal reservoir. The water can then travel up into wells and be used to generate energy. In geothermal power plants the heat/steam provides the force that spins the turbine generators and produces electricity. The heat or steam then returns to the reservoir to maintain pressure and sustain it. The U.S. alone produces 2700 megawatts of power from geothermal energy in a year. This is the equivalent of burning 60 million barrels of crude oil a year. -	Geothermal energy saves money: Since resources do not need to be hauled in to run a geothermal power plant, no money is spent on running the power plant. This translates into more government funding spent on more important technological energy advances. This would also allow for people to save money on purchasing energy. - Geothermal energy is reliable: Geothermal power plants are designed to run all the time with no interruptions due to weather or natural disasters, unlike traditional power plants that need fuels to be hauled in to keep them running. - Geothermal energy does not harm the environment: The geothermal process does not burn nonrenewable resources to spin turbines to generate electricity. Therefore no harmful pollutants are released and resources are conserved. Outdoor air temperatures fluctuate throughout the year with the changing seasons. In contrast, ground temperatures about four to six feet below the Earth’s surface remain relatively moderate and constant all year. This is because the Earth absorbs 47% of all the heat energy from the sun that reaches its surface. A geothermal system circulates a water-based solution through a buried loop system to take advantage of these constant temperatures. A single piece of equipment has the ability to heat and cool your home, while providing some or all of your home’s hot water as well. Geothermal systems can save you 30-70% on your monthly utility bills. This is a very good alternative for Holland. Ocean Thermal Energy Conversion uses the temperature difference between the water deep in the ocean and near the surface. We could theoretically do this in Holland because of the two lakes. However, the technology is not quite developed to be cost efficient or to keep the lakes’ ecosystems from harm. If this technology could be developed, we would have a very reliable, efficient, and clean energy resource. Biomass thermal energy uses biomass (dead plants) to create heat energy. This is 90% efficient and would be a great asset in the winter.